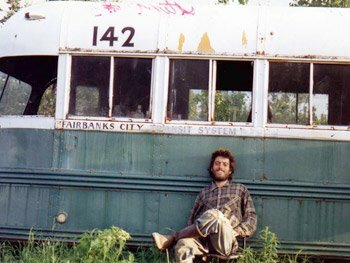 In 1990 Chris McCandless donated all of his life savings to OXFAM and went into the wild to live in the Alaskan outback. He had the feeling he didn’t belong in the life his parents planned for him. He knew they’d not take no for an answer, wearing him down like a chainsaw until he collapsed under the weight of their expectations. After two years of wandering around America, he made it to Alaska, but never made it out. His body was found by hunters two weeks after he’d starved to death. My grandmother’s great dream for my mom was that she become a schoolteacher and marry a nice Milwaukee boy, quit her job and raise her family. My mom had other plans: She went into the great global wild to become a peace activist in the heated 1960s, traveled the world, got a job with UNICEF, married a Sri Lankan, had three brown babies and kept right on living all over the world. During the phenomenal Dialogue 2010 I met a woman, Jocelyn, who, like my mother, was born and bred in a white community but always felt there was something missing in her life, that somehow she didn’t belong. Like my mom, Jocelyn searched for her destiny outside America and found it in the wild of China, where she managed to learn Chinese in one year, fell in love with a local, got married and now works as a translator. Dialogue 2010 also introduced me to Elmira, whose parents left Turkey for the unknown of America. Elmira grew up shuttling between the madness of New York City and her traditional Turkish household right smack in the middle. In our discussion about hybrid lifestyles and location, I declared myself as not only living a hybrid lifestyle, but being hybrid through my core. Parents from two different cultures, globetrotting from birth, compounded by a myriad of creative urges that I always felt aligned me more with monsters and freaks than the so-called norms. This got me to thinking about how so many of us grow up, regardless of the diversity or lack thereof around us, feeling we are different from our families or the majority of people around us. The intuition that our lives have a purpose that will not be run of the mill, what our parents want, or even what we wish it to be. Something new and unexpected. Being born hybrid is knowing your path is hidden, overgrown, or far away, developing the courage it takes to trust ourselves and start from scratch by blazing a trail. There is no choice in the matter, our hybridity forces us, drives us, inspires us. Being born hybrid is going into the wild in our own way, finding a home or at least some peace, somewhere in the uncharted out there of our futures. Were you born hybrid? How did you find a life that fulfilled your hybridness? emailFacebookTwitterPinterestTumblrStumbleUponDiggRedditWhen I was first covering the human rights meetings in Geneva in 2004, long before I knew about this thing called a “weblog,” I was posting reports about the UN sessions through FreeWebs and handing out business cards with the site address to build readers. In 2005 I retained the rights to www.Sezin.org, but continued… Read full post. On the family that we choose. Read full post. Heath, myself, and death. Read full post. Sometimes we lose things that don’t come back. Read full post. emailFacebookTwitterPinterestTumblrStumbleUponDiggRedditI am writing from my temporary desk in the offices of the Turkish Daily News with a gray view of the concrete wasteland that is Istanbul. It is Sunday. There is something very unnatural about being at work on Sunday, especially since my bus to get to work leaves at 830 AM and no one… Read full post. emailFacebookTwitterPinterestTumblrStumbleUponDiggRedditIndeed the last week or so since my Bobby Kennedy experience has been intense. I have had to deal with the strangest dreams, the strangest situations both in life and online and a lot is being released. I have, of late, been using the Aztec Calendar to make decisions and get myself into balance with… Read full post.